It is unclear how many people have pituitary incidentaloma, but imaging and autopsy studies indicate they are quite common and occur in up to one-third of patients. Fortunately, the vast majority of these serendipitously discovered tumors are clinically insignificant. A management guideline in the Annals of Endocrinology brings endocrinologists up to date on current thinking about pituitary incidentaloma management. Endocrinologists classify these tumors as micro- or macro-. Microincidentalomas are discovered in around 10% of patients, often upon CT after a fall, and are less than 1 cm in diameter. They may grow, but only 5% proceed to macroincidentaloma. Currently, experts recommend assessing nonfunctioning (NF) microincidentaloma clinically for signs of hypersecretion (hyperprolactinemia, acromegaly or Cushing’s syndrome), with subsequent systematic prolactin and IGF-1 assay. Pituitary incidentalomas that are larger than 1 cm at discovery—macroincidentalomas—are more likely to grow, with 25% and 24%-40% of patients having larger tumors at 4 and 8 years after diagnosis respectively. Concerns escalate and closer surveillance is needed if a macroadenoma is in contact with the optic chiasm. With any NF macroincidentaloma, experts recommend assessing patients for signs of hormonal hypersecretion or hypopituitarism. Then, laboratory screening for hypersecretion or hormonal deficiency is needed, as is ophthalmologic assessment (visual acuity and visual field) if the lesion is near the optic chiasm (OC). Surveillance differs by tumor size, with 5 mm the cutoff for NF microincidentaloma. Tumors smaller than that require no surveillance, and those larger need to be monitored with MRI at 6 months and then 2 years. Endocrinologists should revisit macroincidentaloma distant from the optic chiasm with MRI at 1 year and conduct hormonal exploration (for anterior pituitary deficiency), then monitor every 2 years. Proximity to the optic chiasm often creates a need for surgery or increased vigilance. MRI is recommended at 6 months, with hormonal and visual assessment, then annual MRI and hormonal and visual assessment every 6 months. Specific types of pituitary incidentaloma call for surgery: evolutive NF microincidentaloma, NF macroincidentaloma associated with hypopituitarism or showing progression, incidentaloma compressing the optic chiasm, possible malignancy, non-compliant patient, pregnancy desired in the short-term, or context at risk of apoplexy. Major hormonal changes emerge during pregnancy. 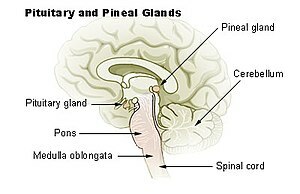 The pituitary gland is one of the most affected organs with altered anatomy and physiology. The pituitary gland is enlarged as a result of lactotroph hyperplasia. Due to physiological changes in the pituitary and target hormone levels, binding globulins, and placental hormones, hormonal evaluation becomes more complex in pregnant women. As a consequence of physiological hormonal changes, the evaluation of pituitary functions in pregnant women is quite different from that done in the prepregnant state. Pituitary adenomas may cause problems by their hormone secretion that affects the mother and the fetus besides causing an increased risk of tumor growth. Furthermore, diagnosis, course, and treatment of pituitary diseases point out differences. The changes in anatomy and physiology of the pituitary gland during pregnancy are reviewed. Pituitary disorders namely Cushing’s disease; acromegaly; prolactinoma; TSH-secreting, gonadotropin-producing, and clinically nonfunctioning adenomas; craniopharyngioma; and Sheehan’s syndrome, which is one of the most common causes of hypopituitarism, lymphocytic hypophysitis, and hypopituitarism, in relation to pregnancy are discussed. Being aware of all this information will prevent any serious problems which mother and child will be exposed to.